Up until now I’ve avoided opera—not out of malice or a disdain for the music (my dad had a large collection of classical LPs he used to play when I was a kid which included a number of opera scores, and I remember enjoying them), but simply because I didn’t feel qualified to give an intelligent appraisal of the art. So when I was invited to join some friends for an operatic performance of Carmen, I thought it my duty to experience this centuries-old art form for myself. You see, pretty much everything I know about opera I learned from Gilligan’s Island and certain Warner Brothers cartoons. (Who can forget Elmer Fudd dressed as a Valkyrie singing “Kill da Wabbit!” or Bugs Bunny performing a Barber of Seville-style haircut?) I enjoy most types of music, and as a musician, I’ve played in a variety of settings over the years, from orchestras and jazz ensembles to rock bands and Irish pub groups. But in my three decades of playing music, I had yet to see a classical opera. I must say my experience watching Carmen was certainly illuminating. I’m a firm believer that, in the world of the arts (as in most areas of life), nothing equals the experience of being in the presence of people who are masters of their crafts. Whether it’s Yo Yo Ma coaxing notes from his cello, Paddy Maloney churning out jigs and reels on his uilleann pipes with The Chieftains, or Randy Johnson throwing a perfectly placed fastball or slider (yes, I do consider top-level athletes to be just as much artists as dancers or singers), I’ve always been enamored by people who are really good at what they do. This is not to say that I am now an ardent devotee of the operatic arts. As in many of life’s endeavors, some tastes are acquired (like coffee or beer). For an opera novice like myself, there are several hurdles to be overcome, such as the communication gap. For those of us plebeians in the audience whose college major was something other than Romance Languages, the company provided subtitled lyrics which were projected onto a narrow screen above the stage. While this was certainly helpful (for non-French speakers, it was essential—although even for a native Frenchman, it would have been difficult to decipher the singers’ lines through all the operatic warbling), it also created a sort of paradox; I realized as the words were flashed before me that it seemed to take an eternity for the singers to say whatever it was they were trying to communicate. There was one character in particular who spent ten minutes trying to relay four lines of dialogue to her boyfriend. (And every time she took the stage, she said the same thing: “Here’s a message from your mother.”) About two hours into the show, I started glancing down at my wristwatch, and there were a couple of moments when I would’ve sworn I saw the date change. Of course, much of my problem with the time factor could be attributed to my own limited attention span. We moderns are used to two-hour movies and thirty-minute sitcoms. Elizabethans, by contrast, thought a preacher was just getting warmed up when his sermon reached the three-hour mark. Oh, how times have changed. According to the historical information printed in the Carmen playbill, the 16th century composers who helped introduced the world to opera believed that the “current state of dramatic and musical expression was inadequate to convey the complexity of human emotion.” I don’t know about that. Sophocles used music and poetry to tell stories pretty effectively. And of course, there’s always Shakespeare. I think his narratives came out alright—even without the song-and-dance numbers and the ten minute arias. But hey, what do I know? 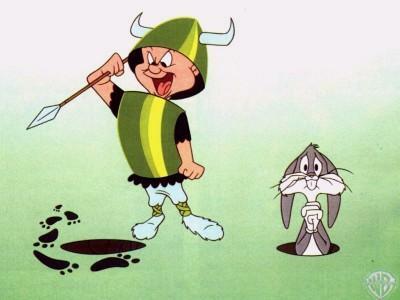 I’m just an amateur who likes cartoons that feature speech-impaired hunters chasing rabbits around with spears. I agree opera is an acquired taste, but it is one that I love. For me part of the enjoyment is the deciphering and then understanind of the lyrics, perhaps not unlike understanding the plays in a football game. But among the miltitude of talented athletes and all of those who can perform the functions well, there are few Michael Jordans among the masters. And there are few operatic stars who can carry an aria with not just the skill but a depth of emotion that will elicit an appreciation of the warbling beyond the technical conventions. Someone with an appreciation of the arts, such as yourself, would likely be blown away by such an occurrence. I hope you get to experience that someday. Great post – thanks for sharing your thoughts and experience.